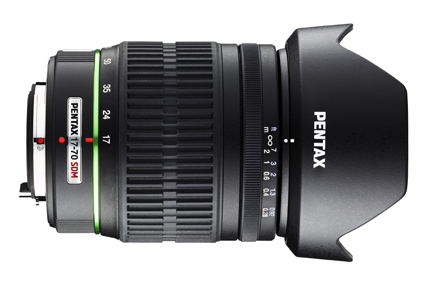 Pentax has confirmed the release of a 17-70mm lens, designed to be used on its range of digital SLRs. Marketed as a standard zoom, the Pentax-DA 17-70mm f/4 AL [IF] SDM zoom boasts a 35mm viewing angle equivalent of a 26-107mm lens. It will arrive in UK stores in ‘mid-July’, priced £449. ?It offers the most frequently used focal lengths in day-to-day photography, making it ideal for a host of casual applications, including scenery, snapshot and portraiture,? claims the firm. The 17-element-in-12-group newcomer features a minimum focusing distance of 0.28m and a Super Protect (SP) coating to help repel dust, water and grease.